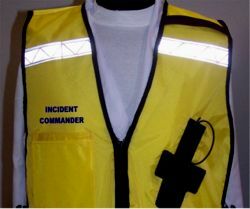 One of our most popular vests for ICS, CPs and EOC leaders that want pockets for gear and notes and a radio attached option on the vest. 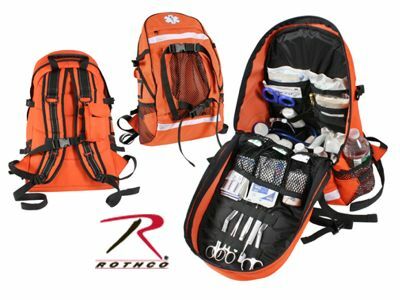 Our EMS Style Multi-Pocket Vest with built in adjustable radio holster is a big hit. Our Velcro style radio holster design, fits a wide variety of 2-way radios and scanners - even many cell phones.Our radio vest is 20" wide by 26" long with 4 adjustable side release buckles. 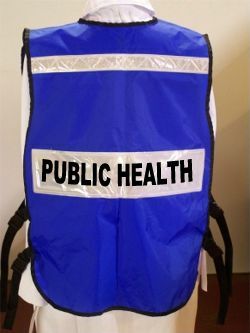 The vests expand to over 76" and will fit over bulky jackets and turnout gear. 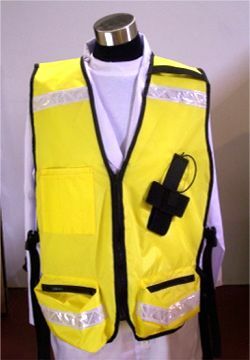 Each vest features a titled 4" reflective panel on the back sewn onto rugged water-resistant nylon vest material. Available in a wide variety of colors (currently 10). Highly adjustable radio holster sewn on the left side and angled to avoid antenna interference but allows easy viewing and access to top switches and dial settings. 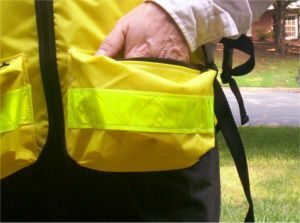 Two large lower zippered cargo pockets. 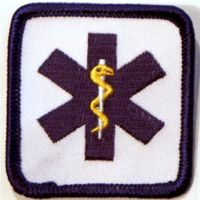 An upper combo pencil/marker/notepad pocket for triage tags and other notes.